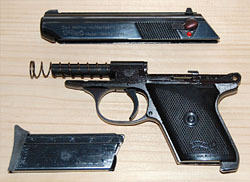 Walther’s production of the new Taschenpistole mit Hahn (TPH, vest pocket pistol with hammer) started in July 1969, parallel to the Walther TP. Analogous to its sister TP, the TPH was built in caliber .25 ACP (6.35 mm Browning) and .22 long rifle. The pistol was packaged in a brown box which included a manual, a cleaning rod and a certificate with a 5-round shot group. The TPH is blow-back operated and does not have a breech locking system. The barrel is fixed to the frame and fits tightly in the slide so that no bushing is needed. The recoil spring is assembled around the barrel and is retained and compressed by the slide such that no bushing is necessary. 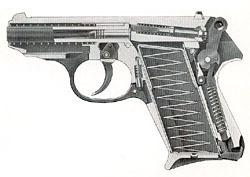 Unlike the Walther TP, with its open-top slide, the TPH has an enclosed breech with an ejection window. The extractor is a L- shaped piece of steel which is spring supported and positioned in a groove on the right side of the frame beside the striker. 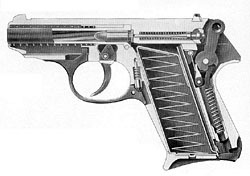 Similar to the TP, the ejector is positioned on the left side of the breech block behind the magazine well and the connector runs externally on the right side of the frame, beneath the right grip plate. The one-piece firing pin and the striker spring protrude through the safety arbor and are hold in position by it. There is a break-trough on the left side of the slide where the safety lever, which is fixed to the arbor, is positioned. 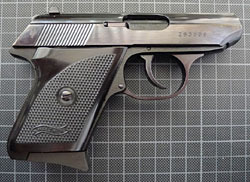 It has a 60-degree turn similar to the late PPK models, with down as the safe position and up as the firing position simultaneously showing a red mark. The safety mechanism is particularly worth taking a closer look at it (see Fig. 1). In the safe position the safety lever covers the red mark and the hammer (30) rests on the safety arbor. Even if the gun should fall down on the hammer the impulse can not reach the striker (54). 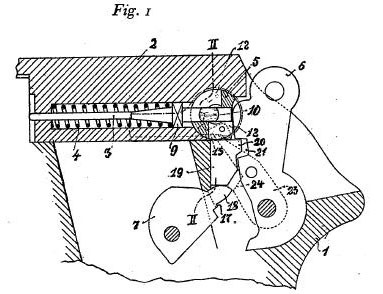 This is the safety mechanism we find in the Walther PP and PPK which was patented by Walther on 7th November 1930 (German patent No. 578765--see Fig. 2). But there are some slight differences: The safety arbor of the TPH pushes the release lever (15) downward and so disengages the trigger pawl (28) and the trigger bar (12). So the trigger can be pulled without cocking the hammer. I was able to confirm only one pistol in .25 ACP with the short inscription (SN 299.409). Additionally I found several .22 versions of which the earliest has SN 296522. The TPH variants differ in the position of the serial number. On early models the serial number is located on the right side of the frame behind the trigger guard. Then somewhere between in 1970 and 1971, around serial number 260.000, the serial number was moved to the right side of the slide near the muzzle. Late models have the serial number under the ejection window. Besides the inscription and position of the serial number, the TPH was changed three times. 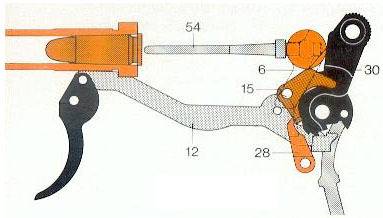 1970 (starting at SN 252300) the trigger pawl and release lever were changed. Older models were improved with mounting kit “Einlage TPH 222 46 07”. 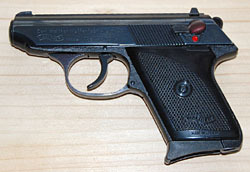 In March 1986 (starting at SN 295730) there was a change of the magazine release lever which now has an additional pin. On the late TPH the trigger guard can only be pulled downward when there is no magazine in the gun. All models have a German nitro proof mark, usually on the right rear side behind the serrations. But I also have a .25 ACP model with the proof mark on the left side--the only one I have ever seen. The barrel has a final nitro proof mark, antlers, as the symbol of the Ulm proof house, and the year of proof as a two digit number. On late models the number was changed to a two digit letter code (A=0; B=1; C=2; D=3; E=4; F=5; G=6; H=7; I/J=8; K=9). The sights are close to those of a modern competition pistol, with a wide rear gap, a wide front sight and white markings which enable the shooter to align them quickly and accurately. On both sides of the slide the gun has 17 trianguar-cut serrations. The two-piece black plastic grips have a fine checkering with the Walther-banner inside. On the bottom of the left grip is the inscription “Made in Germany”. The magazines, either in .22 long rifle or .25 ACP, hold six cartridges and have a black plastic finger rest to support the ring finger and the pinky. Five holes allow a visual check of the number of cartridges in the magazine. The magazines are engraved with the caliber on the bottom left and the Walther-Banner on the right side. Later .22 long rifle magazines show the caliber and the Walther-Banner on both sides and have an additional numbering beside the holes. Most standard models have a dark shiny blue finish which sometimes turns into violet. But I have also a .25 ACP model which has a matte grey finish which usually can be found on late .22 long rifle versions. Additionally Walther offered engraved luxury versions in blue, silver, and gold finish with standard plastic, wooden or carved walnut grips. The Walther TPH continued in production until 1999 with a total of approximately 35.000 pieces in .22 long rifle and approximately 20.000 pieces in .25 ACP. All pistols have a six-digit serial number. The serial number range starts at 250.001 and goes up to 305.137. So there was a total of 55.137 pistols made with a constant numbering regardless of the caliber. There has also been production of a stainless steel version for the US market by Interarms which began in 1987. Those pistols have minor differences such as the weight (stainless steel frame instead of aluminium), magazine weldings, a stronger recoil spring and red sight markings instead of white ones. I also recorded blued models which have Interarms markings. If anyone can contribute more detailed information, we would kindly appreciate receiving it from our readers. Please write with your serial number and describe your gun or include photographs. Apply safety catch and remove the magazine. Make sure the chamber is empty. Pull the trigger guard downward, push it sideways with the index finger and allow it to rest on the underside of the frame. Secure trigger guard in that position with index finger. Pull the slide fully back, lift it up, allow to glide forward and ease it off the front of the frame. The pistol has now been taken down into its three main components. SCHAAR, Rudolf: “Taschenpistolen: Die Walther TPH,” Deutsches Waffenjournal, July 1972. Copyright 2012 by Stefan Klein. All rights reserved.